What lengths would you go to in order to ride a bicycle? AFGHAN CYCLES follows a generation of Afghan women who are pedaling their own revolution, aggressively challenging gender and cultural barriers using the bicycle as a vehicle for freedom, empowerment, and social change. This film has been generously sponsored by Karen Fienberg & Paul Mack; and by Cassie Pence & Tim Szurgot. An extraordinary, heartfelt conversation about the dynamics of modern sexuality. BETWEEN THE SHADES puts faces to the letters that make up the LGBTQI community and examines the immense power of labels and the transcendence of love. Fifty people, each with a connection to the LGBTQI community, share their stories in this powerful, audience favorite. A film that is a classic reminder that love truly is love -- and one that captures the immense diversity of the LGBTQI community. A hypnotic and haunting blend of documentary and narrative filmmaking. ISLAND OF THE HUNGRY GHOSTS focuses on Poh Lin, a trauma therapist who works with inmates of an Australian high-security immigration detention center, 1000 miles from its shores. Here, among the forty million migrating crabs and the “hungry ghosts” (souls that never received a proper burial) these asylum-seekers are housed in prison-like conditions and await another kind of migration; one that might allow them to enter a peaceful country — someplace like Australia. Skateboarding is not a crime, and it just might save your life. MINDING THE GAP weaves stellar boarding footage into the stories of three young men from the American Rust Belt who bond together to escape their volatile family lives. Skateboarding is their common refuge. As they face adult responsibilities, unexpected revelations threaten their decade-long friendship. This film has been generously sponsored by Carol Ann May & Jim Saindon. The internet today can be a battleground. NETIZENS exposes the proliferation of cyber harassment faced by women. As the internet becomes the next frontier of civil rights, this feature documentary follows three women who are targets of harassment, along with advocates, legal experts and others, as they confront digital abuse and strive for equality and justice online. Be inspired by this hopeful story of a woman who survived unimaginable horror at the hands of ISIS. ON HER SHOULDERS follows 23-year-old Nadia Murad, a strong-willed young woman who lived to tell the tale of the 2014 genocide of the Yazidis in Northern Iraq and escaped the hands of ISIS. Nadia has become a relentless beacon of hope for her people, even when at times she longs to lay aside this monumental burden and simply have an ordinary life. American superhero and Supreme Court Justice: meet Ruth Bader Ginsburg, also known as RBG. Still a force to be reckoned with at the age of 85, U.S. Supreme Court Justice Ruth Bader Ginsburg has developed an impressive legal legacy while becoming an unexpected pop culture icon. This revelatory documentary is a loving and informative portrait of the diminutive, quiet warrior's rise. The movie’s touch is light and its spirit buoyant, but there is no mistaking its seriousness nor its passion. This film has been generously sponsored by Ursla & Matthew Null; Karen Hoskin; Emily & Bob Pannier; Barbara Silverman & John Kozyak; and by Anne & Bill Ronai. Get ready to laugh and marvel at the smartest, funniest, most awkward kids in the room. Winner of Sundance’s 'Festival Favorite Award', SCIENCE FAIR follows nine brilliant high school students from disparate corners of the globe as they navigate rivalries, setbacks, failures, and hormones on their quest to win the International Science and Engineering Fair in Los Angeles. This film has been generously sponsored by Kathryn & Luke Kissam; and by Peggy & Vienne Stellina Brody. A modern look at the personal challenges of life on the Navajo Reservation. Filmed over five years, THE BLESSING follows a Navajo coal miner raising his daughter as a single father, and his struggle to reconcile his profound spiritual beliefs with his role in the irreversible destruction of their sacred mountain at the hands of the world’s largest coal producer. This father-daughter relationship is conflicted, hidden, full of expectations, but ultimately, hopeful, free and loving. Do you love Teflon? You might not after this. In 1945, DuPont introduced Teflon, changing the lives of millions of Americans. Today, a biopersistent chemical used to make Teflon is in the bloodstream of 99% of all Americans. A riveting tale of long-term irresponsibility and injustice, this film tells the stories of the whistleblowers and factory workers of Parkersburg, W.V. where polluted water caused birth defects and more. How far are you willing to go to live your beliefs? If a crime is committed in order to prevent a greater crime, is it forgivable? Is it, in fact, necessary? THE RELUCTANT RADICAL follows activist Ken Ward as he confronts his fears and puts himself in the direct path of the fossil fuel industry to combat climate change. Death threats, court battles, and, in the middle of it all, an iconic endangered species. THE TROUBLE WITH WOLVES takes an up-close look at the most controversial wildlife conservation issue of our time: the reintroduction of wolves to Yellowstone National Park and its surrounding states. The film aims to find out whether coexistence is really possible by hearing from the people directly involved. As wolves have recently been re-introduced to Colorado, this film is the primer to nearly every side of the argument. Filmmaker travel has been generously provided by Bob Valentine & Steve Bolton. Is music worth dying over? Is any art? WHEN GOD SLEEPS depicts the journey of Iranian musician Shahin Najafi, exiled to Germany for his critical, often profane songs about Iran and Islam, and then forced into hiding after clerics issue a fatwa for his death. It asks resonant questions about the costs of resistance, what Shahin is willing to lose, perhaps irrationally, to pursue his cause and his art. This film has been generously sponsored by Bob Valentine & Steve Bolton. 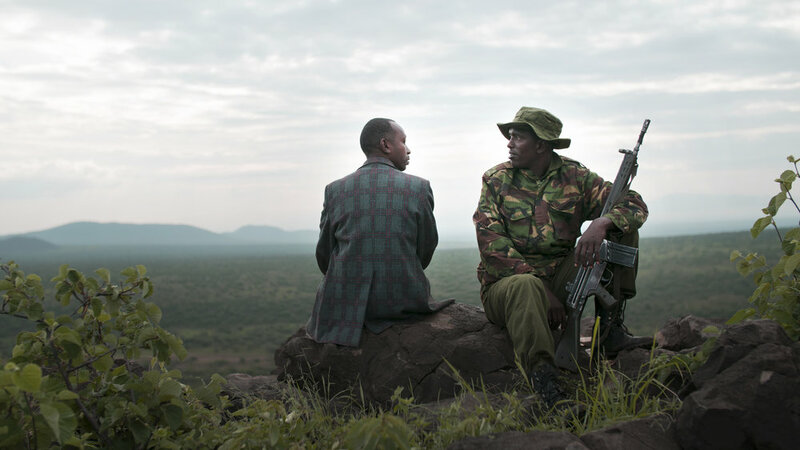 An extremely intimate journey into the personal world of poaching. This film has been generously sponsored by Donna Kindervatter & Berek Novak.